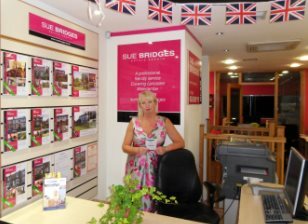 Here at Sue Bridges we aim to make moving house as smooth as possible, by giving you all the help and commitment that we can. We aim to please and our friendly and professional staff are always at hand to help and support you through this exciting but stressful time! Use our property search on this website where you will find comprehensive information about all of our properties including PDF brochures for you to download. Then make sure you register with us here or call us now to let us know your requirements so that we can let you know about any new properties coming on to the market. Even better if you have the time, visit us at our prominent office located on China Street! Once you have found a property that is right for you, we will help you to agree a price that is right too. All in an open, fair and professional manner. If you need to arrange a mortgage we can help too. We will put you in touch with the UK's leading no fee mortgage broker to offer you free advice about the best mortgage to suit you. Call us to find out more. We will keep you regularly updated throughout the legal and mortgage processes so you know how your purchase is progressing. We will speak to the solicitors and estate agents in your chain regularly, keeping the lines of communication open right up to the day you collect the keys to your new home!